Globes, maps and such Insulators Kitchen tools, meal making vintage accessories. Rugs and runners Salt and pepper shakers Table setting and accessories. Our family business strives to provide you with the best shopping experience by providing a marvelous variety of vintage items in a quality finish. You can find products in this section for all interior and exterior decorative need, as well as, shop for vintage-inspired accent display items. Subsection breakdown allows you to browse by the interest or the item designation. If you need a wall decor, table setting, storage, accent pieces, collectibles, toys or any indoor or outdoor additions you had just found a place to fulfill your needs. All kinds of collectibles section are just snapshots of all the items in the store. Following sections specify items found in them. Wicker, wooden, paper mache baskets, metal, wood, paper mache tole trays, English, German, Japanese porcelain, kitchen accessories for storage, meal making, table protective items, Cookie jars from Worldwide manufacturers, paperweights, bookends, pictures, frames, rugs, throws, blankets, all sorts of delightfull vintage candles, vases produces in a span of over 100 years. Thatched Cottage Small Pub Sign made in England. 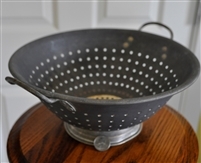 WEAR EVER Aluminum colander by T.A.C.U. Co.
Vintage large Grapes cluster in hard colorful plastic. Vintage Flower sifter, Bromwells Aerator. 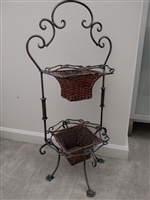 Metal wall hanger with basket, Farmhouse decoration. 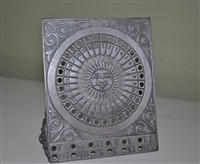 Vintage Perpetual Calendar Germany "Block Zinn" Pewter Sun. Hand woven straw Duck basket. 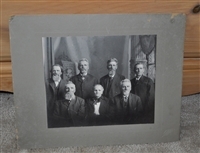 Antique Sepia photograph family picture, Mrs May. Hand crafted wooden box with folk painting by Johnston. Cast Iron Industrial double pulley. 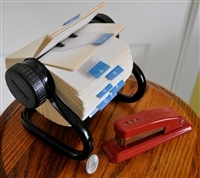 Retro Rolodex and Swingline stapler. Double shelf flower pot in black iron finish. Nautical theme handmade large wooden box. 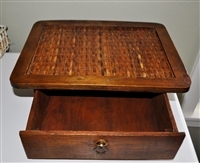 Vintage wooden storage box with woven top and pull out drawer. Vintage Fireman Company cast iron wall plaque, 3.6 lb. 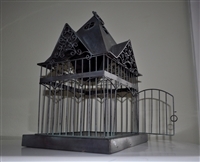 Handcrafted metal decorative bird cage in Victorian house style design. Vintage silver plated Magnifying glass with handle. Quilted throw blanket in 100% cotton, multi technique application. 91" x 89". Vintage pair of 16" tall Brass andirons with cast iron wood log rest.